Editor’s note: On June 12, Ancient Faith Radio aired an interview I did with Bishop Basil of Wichita, the Secretary of our Episcopal Assembly. Recently, I learned that AFR produced a transcript of that interview. For our readers who might prefer text to audio, I’m reprinting that transcript here in full. I’ve made a few minor changes, mostly correcting spelling and punctuation (and if you find any additional errors, please let me know in the comments). To listen to the audio of the interview, click here. Matthew Namee: I’m privileged today to be sitting here with His Grace, Bishop Basil of Wichita, the new Secretary of the Episcopal Assembly. His Grace has graciously agreed to sit down and chat with me a little bit about the Episcopal Assembly, the process, and his own impressions of it. Thank you very much for your time, Sayedna. First of all, could you tell us a little bit about what your impressions were of the meetings? What was it like to be one of the hierarchs there? His Grace Bishop Basil: Before I do that, I just want to thank you for being interested in Episcopal Assembly. It’s been about two weeks now — two, two and half weeks — since the Episcopal Assembly ended, and the enthusiasm that was surrounding the assembly seems to have dwindled a little bit since the Assembly ended. I don’t know what it was that people expected us to do at the Assembly, but something very exciting happened. And I think it’s important that we do talk about it, and that the enthusiasm continue and that it builds. It was a very historic event in that — unlike Ligonier which was self-motivated. You know, that came from the bishops here in the United States and Canada at that time. We convened ourselves — SCOBA convened that meeting for us to define ourselves and to discuss our own ministry here. The atmosphere, that first day, I think was a combination of excitement. We knew this was a historic event as we gathered. It was interesting because there were so many new bishops since our last gathering. Again, it was a SCOBA-sponsored event in Chicago, our last gathering, but so many new bishops since then have been consecrated or assigned here to this country. So we were busy meeting each other. What was evident besides that excitement of just meeting brother bishops was the goodwill. I think that’s a description that characterized the entire assembly for those two days. It was palpable, the goodwill. It didn’t mean there weren’t some rough spots or some levels of uncomfortability, I guess, because we were discussing very serious matters, but the goodwill was palpable. Everyone wanted this thing to work. Everyone was willing to lay aside their own agendas to see what the agenda was that the Mother Churches had presented to us, and it’s a very serious agenda that was given to us. So I think the atmosphere was wonderful. It was evident in the meetings. It was a little bit more staid in the meetings because the meetings, of course, were organized in a very business-like manner, but it was especially evident during mealtimes and during the breaks. The bishops delighted in being together and doing the work of the Church. Matthew: You mentioned the agenda that was given, the purpose of the Assembly. Could you talk a little bit about that? What are we doing with this? But the ultimate task is to prepare the Orthodox of this region, now that we define, or hopefully will define just as the United States, to prepare the Orthodox Christians: that includes hierarchs and priests and deacons and sub-deacons and readers and laity, all Orthodox Christians of this region are to constitute itself as a canonical, single Church. And to use the language that’s been floating around our country for decades: an administratively united Church. That’s one of several committees that has been prescribed for us. Even the names of the committees — we certainly can add to the list of committees — but even the names of the primary committees had been given to us. These are committees that the Mother Churches want us to constitute: a canonical committee, a legal committee, and this committee that will formulate our plan, or our vision for what the Church here in this region — as I said by that time that should be defined as the United States, I’m expecting, what the Church here would look like and how it would function. 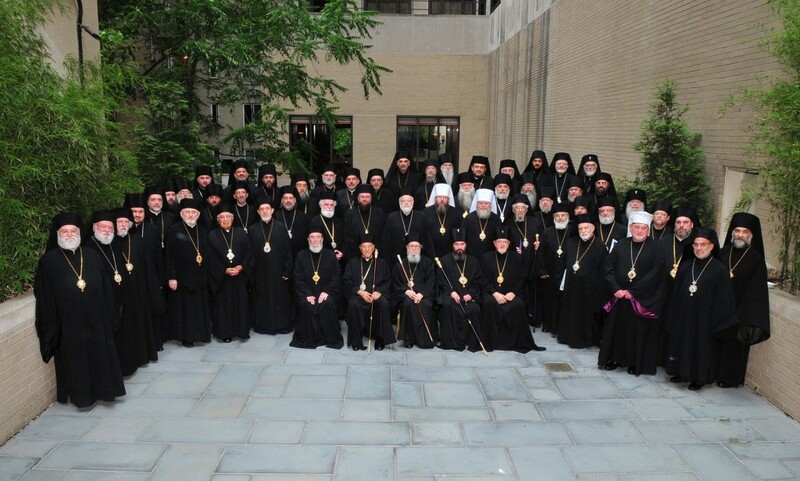 So that when we do go, and all hierarchs of the world, of course, would be invited to that Great and Holy Council, that the hierarchs from America will have adopted through the work of a committee then presented to the entire Episcopal Assembly here that we all tweak and then finally adopt, our plan, then, we would submit then to the Great and Holy Council for what we see the Church in America looking like. That’s a huge task! It’s something that Orthodox Christians in America — I would say the vast majority, I’m not so unrealistic to think that it’s 100 percent, but the vast majority of Orthodox Christians in America have been praying for, have been hoping for, sometimes have been working for, always talking about for a long, long, long time. It seems that it’s at the doorway. I don’t know, you know, we’re Orthodox. I’m not saying it’s going to happen next month or next year even, but it is closer today than it was yesterday. And as I said, what’s unique about this approach is that it’s something that’s coming from the Mother Churches themselves to us. It’s as if they’re saying: look, you have been asking for this. We’re getting ready to give you this, but before we give it to you, we would like to know, what is your plan? That’s really a very exciting kind of task that’s set before us. It’s a very sobering kind of responsibility and it’s one that will take prayer and thoughtfulness and patience, continued humility and goodwill, all of that, I think, topped by what covers all of that is that it’s going to require patience. I think many people were hoping that great fireworks and beautiful things were going to be announced from our Episcopal Assembly in New York City, and it was a rather quiet meeting in that sense. We didn’t have huge announcements coming out, but it was our first meeting, organizing ourselves, getting officers, setting up committees. We couldn’t even finish committees because we need to define the committees before we can ask the men, the hierarchs, to volunteer for a committee. How can they volunteer for something that they don’t know what the committee’s responsibility is? So, we have to do very basic things, and we have to do it carefully as I said, prayerfully, and thoughtfully because this is laying the groundwork for a very profound event, and that’s in God’s time and certainly by his grace, the establishment of a canonically structured Church here in the United States. This late 1950s meeting of Orthodox bishops led to the creation of SCOBA in 1960. At the center, L-R, are Metropolitan Antony Bashir, Archbishop Michael Konstantinides (in front of the US flag, and holding a white object), and Metropolitan Leonty Turkevich. Bishop Basil: At the Episcopal Assembly, His Eminence Archbishop Nicolae of the Romanian Orthodox Archdiocese gave an overview of the 50-year history of SCOBA and its work. And when he was finished, I mentioned to the bishop sitting next to me, “That was the best description of SCOBA I have ever heard.” What’s a shame is that it came at the demise of SCOBA. It was really a brilliant paper presented by Archbishop Nicolae. This is the 50th anniversary year of the establishment of SCOBA: the Standing Conference of the Canonical Orthodox Bishops in the Americas. We were blessed, really, by the work of SCOBA. The work of the Episcopal Assembly was made quite easy by the 50 years that were used as preparation for that. We didn’t come together as strangers. There are no proxies on the Episcopal Assembly because we don’t represent jurisdictions. We’re there because we’re bishops, and only a bishop can be a member of an Episcopal Assembly. We’re not representing jurisdictions. We received invitations, not as members of a jurisdiction but as Orthodox bishops. We bless the memory of the founders of SCOBA. They were brilliant men, people with a lot of foresight for what the Church should be in this country, people like Metropolitan Leonty and Archbishop Michael of the Greek Archdiocese, and others. They foresaw and worked for the day that we’ve come to now, and we bless their memory. We thank those who were their successors in SCOBA who worked right up until the moment of the assembling of the Episcopal Assembly, but there’s something new now, and it’s the fruit that SCOBA bore. Matthew: We’ve heard various things, reports, about the Executive Committee of the Assembly, but my understanding is that the voting is actually done by the whole Assembly. Is that right? The Assembly itself is where the power lies, essentially. Matthew: At the Assembly, you were obviously elected Secretary, and I have understood that you’re not just taking notes and minutes of the meeting. You’ve got a bit more of a role than that. Could you talk about your role and then the Secretariat that you’ll be working with? Bishop Basil: I’m sort of discovering day-by-day. Yeah, the first three officers, the Chair and the two Vice Chairs were done by the diptychs and the presbeia or the seniority within those diptychs, so that the first church among the diptychs is the Church of Constantinople, and the first hierarch of the Church of Constantinople became the Chair. That’s Archbishop Demetrios. The second church in the diptychs is the Church of Alexandria. Well, we don’t have that in America, so they went to the third church in the diptychs which is the Church of Antioch. Senior hierarch of the Church of Antioch in the new world is His Eminence Metropolitan Philip so he’s the first Vice Chair. After that comes Jerusalem. We don’t have Jerusalem in this country. Next in the diptychs comes the Church of Russia and the first hierarch of the Church of Russia in this country is the newly appointed Archbishop Justinian. So he was second Vice Chairman. So the first three positions of the officers were done by the diptychs or the order of the Churches, and by the presbia, there’s seniority within those diptychs. The responsibilities of the Secretary are more than just taking minutes. That would be nice if it were just taking minutes. [laughter] I understand, and I’m understanding more and more every day that it will — its prime responsibility of the office is to oversee a Secretariat and an entire staff, whether it’s one or two or three persons. It certainly won’t be an enormous Secretariat, but that does the work of the assemblies, that spurs on the work of the committees. 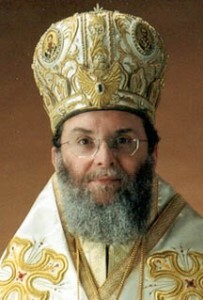 It seems that which will be communicating not only among the hierarchs itself, keeping the hierarchs informed of the work of the assembly that is being accomplished, but the entire Church involving all the clergy and lay people, setting up a website, making sure all the documents that have been issued for or by the assembly are available for everyone to see so there’s no secrecy in anything. Because again, it’s the work of the Church, the body of Christ, which is all of us. Certain tasks, again, were given to the assembly by the preconciliar committee in Chambesy, and the Episcopal Assembly gave it over to the Secretariat to do that. We’re going to have a database of all the Orthodox hierarchs in America which doesn’t exist right now. That will be easy because there’s like 55 of us. Matthew: Thank you very much, Sayedna. Do you have any final thoughts that you’d like to offer before we close this interview? Bishop Basil: I’m so excited about this. Really, I’m very excited, and I hope our clergy and people can be joyfully excited with their hierarchs. We need everyone to help in this. As I said, the bishops now have met. We’re all on the same page. We might not know all the writing on the page, but we’re all on the same page, and we’ll discover what’s written on that page as time goes by. I have my diocese in conference next week. The very first evening I’m going to share all of this with our clergy and more. Your questions were rather specific. I have more things, even, about the Episcopal Assembly I’ll share with all of my clergy and their wives that very first evening, inviting their help and their participation, their ideas, the offering of their talents. Matthew: Sayedna, thank you so much for your time and for telling us all about the Assembly. And we will look forward in the coming weeks and months to getting more information and seeing the website that the Assembly will launch and learning more about what we can do to help the work of the Episcopal Assembly. Your Grace, I believe there are a few typos that you may want to correct. In the next to last sentence of the third paragraph of your response to the first set of questions, in the phrase “…more stayed in the meetings…”, the word “stayed” should be “staid”. In the first sentence of the third paragraph of your response to the second set of questions, in the phrase “…are to constitute itself…”, the word “itself” should be “themselves”. In the next to last sentence of the last paragraph of your response to the same set of questions, in the phrase “…for something that they don’t…”, the word “that” should be “when”. I hope this doesn’t seem too picky. I guess I am an Orthodox Virgo. Donald: I’ve fixed the transcription error that you mentioned (staid). As for the rest, this is a transcript of a voice interview, so it wouldn’t be appropriate to change the actual words of the bishop. I also noted that you began your comment with “Your Grace.” You should know that Bishop Basil does not run this website and is not in any way responsible for its content. Dear Fr. Andrew, Please forgive me for my confusion.